To Cite: Ahmadi Khatir S, Bayatian A , Barzegari A, Roshanravan N, Safaiyan A , et al. Saffron (Crocus sativus L.) Supplements Modulate Circulating MicroRNA (miR-21) in Atherosclerosis Patients; A Randomized, Double-Blind, Placebo-Controlled Trial, Iran Red Crescent Med J. 2018 ; 20(10):e80260. doi: 10.5812/ircmj.80260. Background: microRNAs (miRNAs) are endogenous gene expression regulators, which are involved in the physiopathology of diseases, and potentially make biomarkers in diseases, such as Cardiovascular Disease (CVD). Objectives: Since miR-21 is a robust regulator in plaque formation, this study aimed at identifying the effect of saffron as a functional food and traditional food additive antioxidant in fighting against the progress of atherosclerosis, by modulation of miR-21, as a new circulating marker of inflammation. Methods: In this randomized, double-blind clinical trial, 63 subjects with atherosclerosis were recruited from Emam Sajjad Hospital, Valiasr Hospital, and Zafaranieyh Clinic in Tehran, Iran, and divided randomly to two groups. They received 100 mg/d saffron or a placebo capsule for six weeks. The expression levels of miR-21 were quantified by real-time quantitative-PCR (RT-qPCR) in the blood of patients. Furthermore, fasting blood sugar, lipid profile, and anthropometric index of participants were evaluated before and after the intervention. Results: Statistical analysis showed significant differences in the expression level of miR-21 between atherosclerosis patients, who received placebo, and those, who consumed saffron (P value = 0.02). Moreover, a significant decrease was seen in hip circumference after saffron supplementation (P = 0.049, P = 0.006). Nevertheless, consumption of saffron did not significantly influence other anthropometric indexes and blood biochemical parameters, such as FBS and lipid profile. Conclusions: In the present study, different expression levels of miR-21 were observed between patients with atherosclerosis, who received saffron supplements and placebo; thus saffron may be considered as a novel therapeutic target in cardiovascular disease management. Atherosclerosis is the most common causes of Cardiovascular Diseases (CVD), including myocardial infarction and stroke (1, 2). Increasing blood cholesterol levels (3) and obesity are two factors that lead to the occurrence of atherosclerosis (4). Inflammation is also another important factor that has been reported in many studies (5). Atherosclerosis is a syndrome affecting arterial blood vessels due to a chronic inflammatory response of White Blood Cells (WBCs) in the walls of arteries. This is promoted by Low-Density Lipoproteins (LDL) without adequate removal of cholesterol from the macrophages by functional High-Density Lipoproteins (HDL) (6). The oxidation of human (LDL) is a fundamental mechanism in the initiation of atherosclerosis (7). The disease is initiated when the function of endothelial cells changes, and inflammatory factor, immune cells, monocytes (8, 9), and lymphocytes, especially T lymphocytes, arrive at the endothelial cells, and damage the region and produce inflammatory cytokines (10). Monocytes are turned to macrophages and swallow the cholesterol and are turned to the foam cell (11). Finally, during a few years, inflammatory atherosclerotic lesions significantly expand and lead to necrosis, and prevent effective blood flow (12). Atherosclerotic lesions are suddenly ruptured and cause clots, vascular occlusions, and threatening conditions, such as Myocardial Infarction (MI) and acute brain stroke (13). Moreover, atherosclerosis is a multi-factorial disease formed within the arteries. This general process develops along with aging in all humans (14), and it seems that aging is related to oxidative stress (15). Carotenoids and dietary antioxidants have robust potential free radical scavenging activity, which may exert anti-CVD activity and reduce the risk (16). The protective mechanisms of carotenoids are related to bioactive nutrient effects, as well as antioxidant activity, anti-inflammatory, and nutrigenomics properties (17, 18). Saffron is one of the herbal products of the iridaceous family. Iran produces approximately 80% of world's saffron production, annually. The medicinal properties of saffron are related to crocin, crocetin, picrocrocin, and safranal (19). The most important therapeutic effects of saffron can be attributed to the antioxidant and anti-inflammatory properties of saffron extract and its active ingredients (20). MiR-21 is a member of the family of miRNAs that is expressed in many mammalian tissues and its expression is increased in a number of diseases, such as tumors, cardiac injuries, and inflamed tissues. Some studies have shown that miR-21 suppression improves cardiac hypertrophy (21), and is involved in the mechanism of ischemia- reperfusion (22). miR-21 plays a major role in regulating gene expression in the endothelial cells, and can also contribute to endothelial function and atherosclerosis (23). miRNAs are involved in a variety of cellular and organs' physiological and pathological processes. Dynamic regulation of circulating miRNAs in healthy persons and patients has recently been documented, however, the effects of antioxidants and nutria-supplements to circulating miRNAs are undetermined. Saffron, derived from the flower of Crocus sativus, has been widely used around the world, as a bitter taste and colorant agent for food (24). Since ancient times, people have recognized the health benefits of saffron yet recently there has been a renaissance in research to identify its beneficial properties and mechanisms (24). In this investigation, the researchers aimed at exploring the potential of saffron as a functional food to combat the progress of atherosclerosis and evaluate its role in modulation of miR-21, as a new circulating marker of inflammation (25). Moreover, due to the beneficial effects of saffron in many diseases, such as cardiovascular diseases, and also the role of miR-21 in the pathogenesis of atherosclerosis, this study aimed at investigating the relationship between saffron intake and atherosclerosis, which may provide health professionals with significant molecular mechanism information in terms of clinical practice. The participants of this randomized, double-blind, placebo controlled trial were recruited from Emam Sajjad Hospital, Valiasr Hospital, and Zafaranieyh Clinic of Tehran, Iran, between January 2016 and August 2016. Patients with atherosclerosis (n = 63) included male and female cases with mean age of 30 to 60 years old, diagnosed by a cardiologist with angiography and coronary vessels occluded between 30% and 70% with medical follow-up. The sample size was determined based on the primary information obtained from the study by Fadai et al. (26). Considering 95% confidence interval and 80% power, the sample size was calculated as 30 per group. Thus, sixty- three patients were randomly divided into two groups, using block randomization, which was generated by the Random Allocation Software (RAS). Considering the toxic effects of saffron at higher doses than 1.5 grams, according to previous studies on heart patients, 100 mg saffron was selected (27, 28). The first group received two capsules containing 50 mg/d of saffron and the second group received the placebo. Each patient received two capsules daily for six weeks (29). The general information questionnaire was completed for each participant. The patients were asked not to change their medical treatment approach from two months before the study (if possible) and not take any anti-inflammatory and antioxidant supplements for one month before the start of the study. Each patient signed an informed consent form after being informed of the objectives and method of study. Exclusion criteria included chronic diseases, such as hepatic and renal diseases, infectious diseases, cancer, allergies, and use of immunosuppressive drugs, such as corticosteroids, hematologic disease, pregnancy, and lactation. At the end of the intervention, 58 patients completed the study (Figure 1). The study was approved by the Ethics Committee of Clinical Research of Tabriz University of Medical Sciences, Iran (Ethical code: TBZMED.REC.1394.841) and it was registered at the Iranian registry of clinical trials (IRCT201511192017N25). Health-related parameters were measured before and after six weeks of intervention. The blood sample (~5 mL) was collected from the subjects in non-EDTA containing vacutainers for separating blood serum. The samples were centrifuged at 1000 × g at 4°C for 10 minutes (× 2). Serum was collected carefully and aliquoted in RNase-free tubes and stored at -80°C until future use. All of the study subjects were selected by systematic simple sampling method. Age, gender, smoking, comorbidities, duration of treatment, and serum levels of biochemical parameters, such as Triglyceride (TG), Total Cholesterol (TC), High-Density Lipoprotein (HDL), Low-Density Lipoprotein (LDL) were measured by an auto analyzer (Hitachi, Tokyo, Japan). Weight, body mass index, waist circumference, and hip circumference were recorded in experimental and placebo groups at baseline and end of the study. Height was measured with a stadiometer (accurately 0.5 cm) and weight was measured with a Seca (with a precision of 0.5 kg), with minimum coverage and without shoes. Body Mass Index (BMI) was calculated by weight (in kilograms) divided by height squared (in meters). A BMI of less than 18.5 Kg/m2 was considered as underweight, between 18.5 and 24.9 Kg/m2 as normal weight, between 25 and 29.9 Kg/m2 as overweight, and above 30 Kg/m2 as obesity. Waist and hip circumference with minimum coverage were measured using a non-resilient tape meter (accurately 0.5 cm) in the smallest area between the sub-breast and the hip. All blood serum samples were completely centrifuged again at 3000 × g at 4°C for five minutes to remove the remaining cell debris. Then, 200 μL of serum sample was transferred to a new micro tube and circulating RNA was isolated using miRCURY™ RNA Isolation Kit, Bio fluids (Exiqon, Vedbaek, Denmark), according to the manufacturer's instructions. cDNA was synthesized using the miRCURY LNA™ Universal RT cDNA Synthesis Kit (Exiqon, Vedbaek, Denmark), following the manufacturer protocols. Based on the results, 5 μL RNA was reverse-transcribed in a 20-μL reaction volume at 42°C for 60 minutes, followed by an inactivation reaction at 95°C for five minutes. Real-time PCR (qPCR) was performed using specific LNA (locked nucleic acids) primers [miR-21-5p (assay ID: 204230)] by the SYBR ® Green Master Mix Kits (Exiqon, Vedbaek, Denmark) by the iCycler iQ system (Bio-Rad). The reaction was performed at 95°C for 25 seconds, followed by 42 cycles at 94°C for 5 seconds, and 60°C for 60 seconds. The miR-191-5p was used as an internal control. At the end, the melting curves were generated at 95°C to verify specificity. 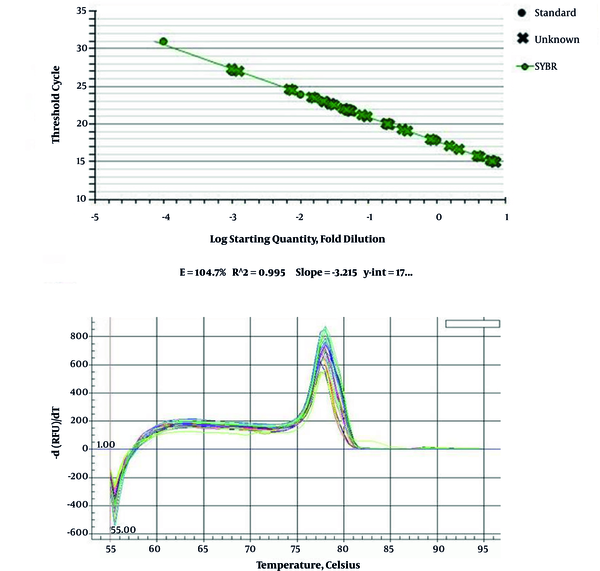 The qPCR efficiency was tested using the tenfold serial dilution method to generate standard curves. The influential variables were adjusted between two Treatment groups (Saffron and Placebo) at the beginning of the study. For quantitative data, outlier data were recognized by Boxplot and replaced by appropriate statistical test, normality was evaluated by K-S test, T-test was used for testing matched variables before intervention, and then Mauchly's W test was checked for identity covariance matrix; finally, nested repeated measure with controlling covariates test was used by Minitab Software version 18.1. The results include three P values for comparing groups between two times. The first was P value Matching for comparing marching between two groups (saffron and placebo) at the beginning of the intervention, the second was P value Group for comparing between two the groups (saffron and placebo) in during intervention, the Final P value Time was used for comparing between before and after measurements. Error-bar was used for showing confidence interval, deference, and their relationships. The power and effect size of this study were 0.936 and 0.683, respectively, which were calculated with the PASS 11 software. Threshold Cycle (Ct) values were used to calculate relative expression with the ΔΔCt method. Statistical significance of miRNAs' transcript expression among experimental groups was assessed with the Reset Software. The level of significance was set at P value < 0.05. All results were expressed as Mean ± SEM Standard Error of Mean (SEM). Table 1 showed demographic features of participants. There were no significant differences between the study groups. Groups were harmonized in all objects at first and during the study. The patients did not describe any signs or harmful effect with saffron consumption during the intervention. a P < 0.05 significantly difference. P value for between group comparisons with Fisher's exact test. b Data are expressed as Mean ± Standard Error. The expression of the miR-21 in atherosclerosis patients with saffron consumption and placebo controls were evaluated and the results were compared. The results showed that expression of miR-21 (P = 0.002) was significantly down-regulated in serum samples of recipients with saffron in comparison with the placebo control group (Figure 2). In 25% of those, who consumed saffron, the expression level was higher than those in the placebo group; however, in 75%, the expression level was either reduced or remained unchanged (Figure 3). The analysis of real-time results for both groups of men and women also showed that the expression level was reduced in those, who had used saffron in either of the groups compared to the placebo group (Figure 4). 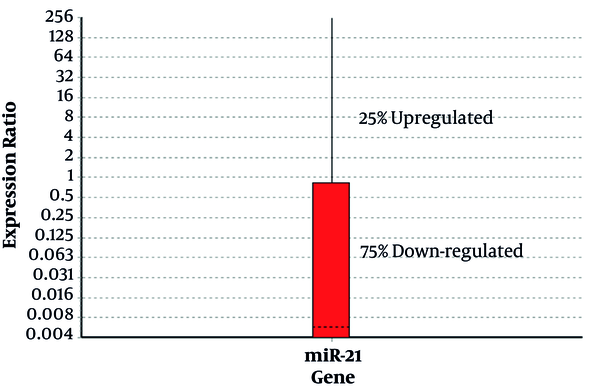 Figure 5 indicates the melting curve and the standard curve for miR-21 expression. According to the Table 2, the mean ± SEM of weight, body mass index, waist circumference, and hip circumference in the saffron group decreased while it increased in the placebo group. In anthropometric indices, only a significant decrease in the hip circumference parameter was observed in the saffron group compared to the placebo (P = 0.049) (P = 0.006). Figure 4. The comparison of expression level in men and women. Decrease in expression level was not affected by the gender, though the expression level was different in both sexes. Abbreviations: BMI, body max index; BP, blood pressure; HC, hip circumference; WC, waist circumference; WHR, waist to hip ratio. a All data are expressed as Mean ± Standard Error. b Pmatching, P < 0.05 significantly difference between two groups the beginning of intervention; Pgroup, P < 0.05 significantly difference for intervention; Ptime, P < 0.05 significantly difference between two times before and after. During the study period, there was a significant difference in weight (P = 0.000) and waist circumference in the saffron group (P = 0.014), and this means that more time is needed to make significant differences in groups. Biochemical parameters are summarized in Table 3. There were no significant differences between study groups regarding biochemical variables at the beginning of the study. After the intervention, a significant decrease was seen in cholesterol (P = 0.027), HDL (P = 0.014), and LDL (P = 0.04) in both groups yet it should be considered that there was no significant difference with time. Some variables, such as age, gender, marital status, education, weight and etc. were considered as confounding factors. Abbreviations: FBS, fasting blood sugar; HDL, high-density lipoprotein; LDL, low-density lipoprotein; VLDL, very-high-density lipoprotein. 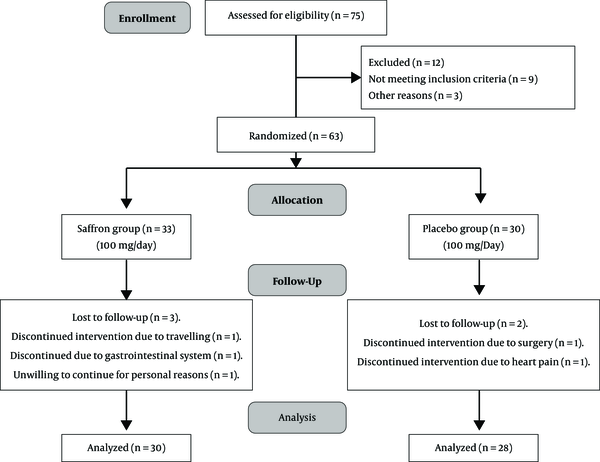 The clinical outcomes of this double-blind, placebo-controlled clinical trial of saffron therapy in patients with atherosclerosis might be briefly summarized as follows: 100 mg/day saffron supplementation for six weeks did not show significantly better clinical efficacy in the prevention of atherosclerosis compared with the placebo groups. However, saffron significantly down-regulated the miR-21 expression level compared with the placebo groups. In addition, this study found that saffron had a significant effect on hip circumference yet no significant effects on FBS, total cholesterol, triglyceride, HDL, LDL, and other anthropometric parameters. Milajerdi et al. showed the beneficial effects of the saffron hydroalcoholic extract on metabolic control in patients with type 2 diabetes. They reported that FBS was significantly reduced following saffron supplementation yet no statistically significant differences were observed in serum lipid levels after the intervention period (30). In another study, Azimi et al. showed that saffron treatment significantly increased HDL levels, and decreased total cholesterol and LDL levels with no significant effects on FBS and anthropometric measures (31). 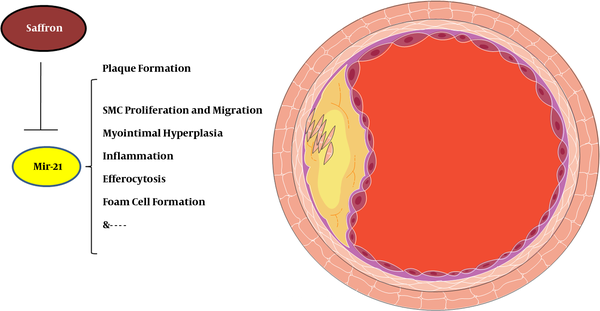 Most previous literature showed that the microRNA expression profile differs significantly between atherosclerotic plaques and healthy subject's arteries. Among the microRNAs profile, miR-21 is implicated to play an important role in the progression of atherosclerosis (32). Some previous studies showed that miR-21 was significantly increased in atherosclerosis (33) and had a high expression in areas susceptible to atherosclerosis (34). Furthermore, it has been reported that miR-21 has a key role in plaque formation and atherosclerosis progress (35). The results from previous studies indicated that saffron supplementation can down-regulate miR-21 expression and as a result could decrease plaque formation and progression in atherosclerosis patients (36). Davis et al. 's study suggested that bioactive dietary, such as retinoids and etc., has protective effects by modulation of miRNA expression (37). A previous study showed that there is a genoprotective effect in aqueous extract of Crocus sativus stigmas and crocin that is inhibited on methyl methane sulfonate (MMS)–induced DNA damage in mice organs (38). Also, a number of studies have indicated that aqueous extract of saffron in mice organs defends from genotoxins-induced oxidative stress and DNA damage (39, 40). All of these beneficial effects of saffron can be explained by the following proposed mechanisms: The regulatory Protein Peroxisome Proliferator Activated Receptor Alpha (PPAR-α) by reducing the Activator Protein 1 (AP1) transcription factor, and reduced the expression of sticky molecules that are involved in atherosclerosis. miR-21 reduced the expression of PPAR-α and thus the risk of atherosclerosis was increased (36). Saffron, through anti-inflammatory and antioxidant mechanisms, such as elimination of free radicals, and increased levels of glutathione reductase and other enzymes prevented the initiation of atherosclerosis (Figure 6) (41). In Rodriguez-Ruiz et al. 's study, the effect of aqueous extract of saffron on the regulation of expression of miR-21 and miR-142 was investigated in basal conditions and oxidative stress. This study showed that miR-21 was significantly increased under stress conditions (24). In 2013, Mehdizadeh et al. showed the cardio-protective effect of saffron extract and safranal in isoproterenol-induced myocardial infarction in Wistar rats. Saffron extract and safranal caused a lower increase in myocardial lipid peroxidation levels, CK-MB, lactate dehydrogenase, and malondialdehyde than the control groups, and less myocardial damage occurred. It seemed these effect may be due to the regulation of oxidative stress (42, 43). Weber et al. showed that stress in vitro indirectly caused increased expression of miR-21 in human endothelial cells and increased the regulation of endothelium-derived nitric oxide and reduced apoptosis of endothelial cells (44). Investigating the beneficial molecular effects of saffron for the first time in atherosclerotic patients in the form of clinical trial was the strength of the current study. This study had some limitations, including low sample size and short duration of the intervention. Therefore, new studies with greater sample sizes and longer intervention duration are needed to evaluate the potential use of miRNAs, as therapeutic biomarkers for atherosclerosis. 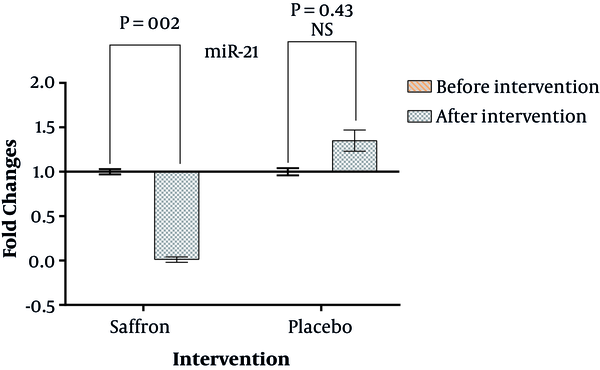 In the present study, differentially expressed miRNAs were observed between atherosclerosis patients that consumed saffron supplements and placebo. The MiR-21 was down-regulated in the saffron group. However, hip circumference was significantly decreased in the saffron group yet had no significant effect on other anthropometrics indexes and biochemical parameters, such as FBS and lipid profile. This work was financially supported by the Nutrition Research Center of Tabriz University of Medical Sciences. The authors gratefully acknowledge Nutrition Research Center, Tabriz University of Medical Sciences, for their technical support. Authors' Contribution: All authors were involved in all parts of this study. The contributions are as follows: Alireza Ostadrahimi and Ayatollah Bayatian were responsible for supervising the study design, as well as overseeing the study implementation. Shonaz Ahmadi Khatir performed the study, collected, and drafted the manuscript. Abdolrasoul Safaiyan and Neda Roshanravan analyzed and interpreted all data. Abolfazl Barzegari and Graciela Pavon-Djavid collaborated in data collection. Ayatollah Bayatian and Shonaz Ahmadi Khatir collaborated in laboratory work. Neda Roshanravan read the first to revise this draft. All authors approved the final draft. Ethical Considerations: This study was approved by the Committee of Clinical Research Ethics in Tabriz University of Medical Sciences, Iran (Ethical code: TBZMED.REC.1395.1345), and it was registered at the Iranian Registry of Clinical Trials (IRCT201511192017N25), and written informed consent was obtained from all the study subjects. Funding/Support: This work was financially supported by Nutrition Research Center of Tabriz University of Medical Sciences (5/71/1207). 1. Barja G. Updating the mitochondrial free radical theory of aging: An integrated view, key aspects, and confounding concepts. Antioxid Redox Signal. 2013;19(12):1420-45. doi: 10.1089/ars.2012.5148. [PubMed: 23642158]. [PubMed Central: PMC3791058]. 2. Torres N, Guevara-Cruz M, Velazquez-Villegas LA, Tovar AR. Nutrition and atherosclerosis. Arch Med Res. 2015;46(5):408-26. doi: 10.1016/j.arcmed.2015.05.010. [PubMed: 26031780]. 3. Kannel WB, Castelli WP, Gordon T. Cholesterol in the prediction of atherosclerotic disease. New perspectives based on the Framingham study. Ann Intern Med. 1979;90(1):85-91. doi: 10.7326/0003-4819-90-1-85. [PubMed: 217290]. 4. McGill HC, Jr, McMahan CA, Herderick EE, Zieske AW, Malcom GT, Tracy RE, et al. Obesity accelerates the progression of coronary atherosclerosis in young men. Circulation. 2002;105(23):2712-8. doi: 10.1161/01.CIR.0000018121.67607.CE. [PubMed: 12057983]. 5. Libby P, Ridker PM, Maseri A. Inflammation and atherosclerosis. Circulation. 2002;105(9):1135-43. doi: 10.1161/hc0902.104353. [PubMed: 11877368]. 6. Hedin U, Hansson GK. Atherosclerosis—disease mechanisms and clinical consequences. In: Thompson M, editor. Oxford Textbook of Vascular Surgery. Oxford University Press; 2016. 3 p.
7. Alissa EM, Ferns GA. Dietary fruits and vegetables and cardiovascular diseases risk. Crit Rev Food Sci Nutr. 2017;57(9):1950-62. doi: 10.1080/10408398.2015.1040487. [PubMed: 26192884]. 8. Bekkering S, Joosten LA, van der Meer JW, Netea MG, Riksen NP. The epigenetic memory of monocytes and macrophages as a novel drug target in atherosclerosis. Clin Ther. 2015;37(4):914-23. doi: 10.1016/j.clinthera.2015.01.008. [PubMed: 25704108]. 9. Rafieian-Kopaei M, Setorki M, Doudi M, Baradaran A, Nasri H. Atherosclerosis: Process, indicators, risk factors and new hopes. Int J Prev Med. 2014;5(8):927-46. [PubMed: 25489440]. [PubMed Central: PMC4258672]. 10. Gong F, Liu Z, Liu J, Zhou P, Liu Y, Lu X. The paradoxical role of IL-17 in atherosclerosis. Cell Immunol. 2015;297(1):33-9. doi: 10.1016/j.cellimm.2015.05.007. [PubMed: 26077826]. 11. Wang S, Zhang X, Liu M, Luan H, Ji Y, Guo P, et al. Chrysin inhibits foam cell formation through promoting cholesterol efflux from RAW264.7 macrophages. Pharm Biol. 2015;53(10):1481-7. doi: 10.3109/13880209.2014.986688. [PubMed: 25857322]. 12. Yuan M, Fu H, Ren L, Wang H, Guo W. Soluble CD40 ligand promotes macrophage foam cell formation in the etiology of atherosclerosis. Cardiology. 2015;131(1):1-12. doi: 10.1159/000374105. [PubMed: 25825037]. 13. Fang L, Moore XL, Dart AM, Wang LM. Systemic inflammatory response following acute myocardial infarction. J Geriatr Cardiol. 2015;12(3):305-12. doi: 10.11909/j.issn.1671-5411.2015.03.020. [PubMed: 26089856]. [PubMed Central: PMC4460175]. 14. Salvayre R, Negre-Salvayre A, Camare C. Oxidative theory of atherosclerosis and antioxidants. Biochimie. 2016;125:281-96. doi: 10.1016/j.biochi.2015.12.014. [PubMed: 26717905]. 15. Dorighello GG, Paim BA, Leite ACR, Vercesi AE, Oliveira HCF. Spontaneous experimental atherosclerosis in hypercholesterolemic mice advances with ageing and correlates with mitochondrial reactive oxygen species. Exp Gerontol. 2018;109:47-50. doi: 10.1016/j.exger.2017.02.010. [PubMed: 28213051]. 16. Griffiths K, Aggarwal BB, Singh RB, Buttar HS, Wilson D, De Meester F. Food antioxidants and their anti-inflammatory properties: A potential role in cardiovascular diseases and cancer prevention. Diseases. 2016;4(3). doi: 10.3390/diseases4030028. [PubMed: 28933408]. [PubMed Central: PMC5456284]. 17. Kussmann M, Stover P. Nutrigenomics and proteomics in health and disease: Towards a systems-level understanding of gene-diet interactions. 2nd ed. Oxford: John Wiley & Sons; 2017. 18. Barzegari A, Pavon-Djavid G. Carotenoids as signaling molecules in cardiovascular biology. Bioimpacts. 2014;4(3):111-2. doi: 10.15171/bi.2014.002. [PubMed: 25337462]. [PubMed Central: PMC4204034]. 19. Rahaiee S, Moini S, Hashemi M, Shojaosadati SA. Evaluation of antioxidant activities of bioactive compounds and various extracts obtained from saffron (Crocus sativus L.): A review. J Food Sci Technol. 2015;52(4):1881-8. doi: 10.1007/s13197-013-1238-x. [PubMed: 25829569]. [PubMed Central: PMC4375186]. 20. Milajerdi A, Mahmoudi M. [Review on the effects of saffron extract and its constituents on factors related to nervous system, cardiovascular and gastrointestinal diseases]. J Clin Excellence. 2014;3(1):108-27. Persian. 21. Sheedy FJ. Turning 21: Induction of miR-21 as a key switch in the inflammatory response. Front Immunol. 2015;6:19. doi: 10.3389/fimmu.2015.00019. [PubMed: 25688245]. [PubMed Central: PMC4310327]. 22. Xu X, Kriegel AJ, Jiao X, Liu H, Bai X, Olson J, et al. miR-21 in ischemia/reperfusion injury: A double-edged sword? Physiol Genomics. 2014;46(21):789-97. doi: 10.1152/physiolgenomics.00020.2014. [PubMed: 25159851]. [PubMed Central: PMC4280148]. 23. Kumar S, Kim CW, Simmons RD, Jo H. Role of flow-sensitive microRNAs in endothelial dysfunction and atherosclerosis: Mechanosensitive athero-miRs. Arterioscler Thromb Vasc Biol. 2014;34(10):2206-16. doi: 10.1161/ATVBAHA.114.303425. [PubMed: 25012134]. [PubMed Central: PMC4169332]. 24. Rodriguez-Ruiz V, Barzegari A, Zuluaga M, Zunooni-Vahed S, Rahbar-Saadat Y, Letourneur D, et al. Potential of aqueous extract of saffron ( Crocus sativus L.) in blocking the oxidative stress by modulation of signal transduction in human vascular endothelial cells. J Function Food. 2016;26:123-34. doi: 10.1016/j.jff.2016.07.003. 25. Olivieri F, Spazzafumo L, Santini G, Lazzarini R, Albertini MC, Rippo MR, et al. Age-related differences in the expression of circulating microRNAs: miR-21 as a new circulating marker of inflammaging. Mech Ageing Dev. 2012;133(11-12):675-85. doi: 10.1016/j.mad.2012.09.004. [PubMed: 23041385]. 26. Fadai F, Mousavi B, Ashtari Z, Ali beigi N, Farhang S, Hashempour S, et al. Saffron aqueous extract prevents metabolic syndrome in patients with schizophrenia on olanzapine treatment: A randomized triple blind placebo controlled study. Pharmacopsychiatry. 2014;47(4-5):156-61. doi: 10.1055/s-0034-1382001. [PubMed: 24955550]. 27. Schmidt M, Betti G, Hensel A. Saffron in phytotherapy: Pharmacology and clinical uses. Wien Med Wochenschr. 2007;157(13-14):315-9. doi: 10.1007/s10354-007-0428-4. [PubMed: 17704979]. 28. Verma SK, Bordia A. Antioxidant property of Saffron in man. Indian J Med Sci. 1998;52(5):205-7. [PubMed: 9808914]. 29. Bourges C. Use of saffron and/or safranal and/or crocin and/or picrocrocin and/or derivatives thereof as a sateity agent for treatment of obesity. Google Patents. 2017. 30. Milajerdi A, Jazayeri S, Hashemzadeh N, Shirzadi E, Derakhshan Z, Djazayeri A, et al. The effect of saffron (Crocus sativus L.) hydroalcoholic extract on metabolic control in type 2 diabetes mellitus: A triple-blinded randomized clinical trial. J Res Med Sci. 2018;23:16. doi: 10.4103/jrms.JRMS_286_17. [PubMed: 29531568]. [PubMed Central: PMC5842443]. 31. Azimi P, Ghiasvand R, Feizi A, Hariri M, Abbasi B. Effects of cinnamon, cardamom, saffron, and ginger consumption on markers of glycemic control, lipid profile, oxidative stress, and inflammation in type 2 diabetes patients. Rev Diabet Stud. 2014;11(3-4):258-66. doi: 10.1900/RDS.2014.11.258. [PubMed: 26177486]. [PubMed Central: PMC5397291]. 32. Fan X, Wang E, Wang X, Cong X, Chen X. MicroRNA-21 is a unique signature associated with coronary plaque instability in humans by regulating matrix metalloproteinase-9 via reversion-inducing cysteine-rich protein with Kazal motifs. Exp Mol Pathol. 2014;96(2):242-9. doi: 10.1016/j.yexmp.2014.02.009. [PubMed: 24594117]. 33. Jiang Y, Wang HY, Li Y, Guo SH, Zhang L, Cai JH. Peripheral blood miRNAs as a biomarker for chronic cardiovascular diseases. Sci Rep. 2014;4:5026. doi: 10.1038/srep05026. [PubMed: 24848278]. [PubMed Central: PMC4052773]. 34. Jin H, Li DY, Chernogubova E, Sun C, Busch A, Eken SM, et al. Local delivery of miR-21 stabilizes fibrous caps in vulnerable atherosclerotic lesions. Mol Ther. 2018;26(4):1040-55. doi: 10.1016/j.ymthe.2018.01.011. [PubMed: 29503197]. [PubMed Central: PMC6080193]. 35. Barwari T, Rienks M, Mayr M. MicroRNA-21 and the Vulnerability of Atherosclerotic Plaques. Mol Ther. 2018;26(4):938-40. doi: 10.1016/j.ymthe.2018.03.005. [PubMed: 29571964]. [PubMed Central: PMC6080134]. 36. Schober A, Nazari-Jahantigh M, Weber C. MicroRNA-mediated mechanisms of the cellular stress response in atherosclerosis. Nat Rev Cardiol. 2015;12(6):361-74. doi: 10.1038/nrcardio.2015.38. [PubMed: 25855604]. 37. Davis CD, Ross SA. Evidence for dietary regulation of microRNA expression in cancer cells. Nutr Rev. 2008;66(8):477-82. doi: 10.1111/j.1753-4887.2008.00080.x. [PubMed: 18667010]. 38. Hosseinzadeh H, Abootorabi A, Sadeghnia HR. Protective effect of Crocus sativus stigma extract and crocin (trans-crocin 4) on methyl methanesulfonate-induced DNA damage in mice organs. DNA Cell Biol. 2008;27(12):657-64. doi: 10.1089/dna.2008.0767. [PubMed: 18788978]. 39. Premkumar K, Abraham SK, Santhiya ST, Gopinath PM, Ramesh A. Inhibition of genotoxicity by saffron (Crocus sativus L.) in mice. Drug Chem Toxicol. 2001;24(4):421-8. doi: 10.1081/DCT-100106266. [PubMed: 11665650]. 40. Premkumar K, Thirunavukkarasu C, Abraham SK, Santhiya ST, Ramesh A. Protective effect of saffron (Crocus sativus L.) aqueous extract against genetic damage induced by anti-tumor agents in mice. Hum Exp Toxicol. 2006;25(2):79-84. doi: 10.1191/0960327106ht589oa. [PubMed: 16539212]. 41. Naghshineh A, Dadras A, Ghalandari B, Riazi GH, Modaresi SM, Afrasiabi A, et al. Safranal as a novel anti-tubulin binding agent with potential use in cancer therapy: An in vitro study. Chem Biol Interact. 2015;238:151-60. doi: 10.1016/j.cbi.2015.06.023. [PubMed: 26102007]. 42. Mehdizadeh R, Parizadeh MR, Khooei AR, Mehri S, Hosseinzadeh H. Cardioprotective effect of saffron extract and safranal in isoproterenol-induced myocardial infarction in wistar rats. Iran J Basic Med Sci. 2013;16(1):56-63. [PubMed: 23638293]. [PubMed Central: PMC3637905]. 43. Guleria P, Goswami D, Yadav K. Computational identification of miRNAs and their targets from Crocus sativus L. Arch Biolog Sci. 2012;64(1):65-70. doi: 10.2298/abs1201065g. 44. Economou EK, Oikonomou E, Siasos G, Papageorgiou N, Tsalamandris S, Mourouzis K, et al. The role of microRNAs in coronary artery disease: From pathophysiology to diagnosis and treatment. Atherosclerosis. 2015;241(2):624-33. doi: 10.1016/j.atherosclerosis.2015.06.037. [PubMed: 26117399]. 45. Gao Y, Peng J, Ren Z, He NY, Li Q, Zhao XS, et al. Functional regulatory roles of microRNAs in atherosclerosis. Clin Chim Acta. 2016;460:164-71. doi: 10.1016/j.cca.2016.06.044. [PubMed: 27384386]. 46. Canfran-Duque A, Rotllan N, Zhang X, Fernandez-Fuertes M, Ramirez-Hidalgo C, Araldi E, et al. Macrophage deficiency of miR-21 promotes apoptosis, plaque necrosis, and vascular inflammation during atherogenesis. EMBO Mol Med. 2017;9(9):1244-62. doi: 10.15252/emmm.201607492. [PubMed: 28674080]. [PubMed Central: PMC5582411].